John Lunford, FDVG’s newly appointed Senior Board Of Advisor, has announced that Retired Senior Chief Chris Wills, has been selected Assistant Senior Board Of Advisor (XO in Naval terms). Wills retired after 31 years of honorable service to his country first in the U.S. Navy, and then again in the U.S. Coast Guard. Wills responsibilities will include the overall direction, administration, and development of the U.S. Navy Flight Deck Veterans Group’s daily operations, as well as overseeing the organization’s finances and the overall morale of FDVG’s members. Chris Wills was born just north of London, England while his Dad was stationed there in the Army. After returning to the States he spent his early childhood in Paso Robles, CA and his later childhood in Silverton, OR. Chris entered the United States Navy March 8, 1974 under the delayed entry program and left for boot camp the following July. His first Command was with VA-215 flying A-7’s out of NAS Lemoore, CA and made USS Oriskany’s (CVA-34) last cruise which ended in 1976. Since the Air Wing was now without a ship, the CAG then transferred to Mayport, FL three months later and made the final MED cruise on the USS Franklin D. Roosevelt (CV-42) which ended in 1977. Since CAG-19 was again without a ship, the entire Air Wing was decommissioned and Chris was transferred to NAS Whidbey Island with VA-196 flying A-6 aircraft where he made his final deployment on the USS Enterprise (CVN-65) in 1978. 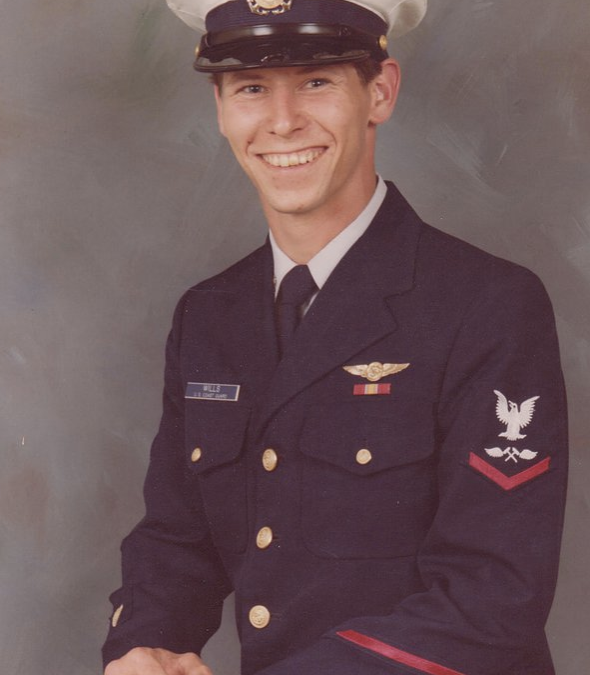 He was released from active duty in 1978 as an AMH3 and joined the United States Coast Guard in 1979. His first Command was at CGAS Arcata, CA working and flying on the HH-52. It was during this time that Chris was credited with 6 lives saved on a SAR case off Cape Mendocino, CA. Since then Chris transferred to the new aircraft the Coast Guard acquired in 1981, which was the HU-25 Falcon Jet. As a qualified Dropmaster, Chris spent the rest of his career working and flying on many SAR cases with this aircraft around the Country until his retirement in 2005 as a SCPO.